StopLik is simple to apply as a deterrent for the licking that causes Lick Granuloma, to stop companion animals from licking surgical sites, and from removing IVs, urinary catheters and Seton drains. I have ventured through a year of frustration trying to cure my German Shorthair of a lick granuloma- a year of frustration, learning and EXPENSE! If you have a dog with this problem, I can empathize. However, despite ALL of those websites and vets that say the hope for a cure is minimal, there is a protocol you can follow that will help your dog "kick the habit". First, you have to educate yourself on what can cause your dog to self mutilate. Unfortunately, this is not clearcut and a lot of things need to be evaluated, PLUS, there can be more than one factor. Don't give up! Regardless, you are probably at the point where your animal has a huge, ugly raised open wound and will NOT leave it alone! First, you need to find a way to keep them OFF the area so it can heal. I have tried them all! At this time, every sticky, yicky spray or ointment you put on it will not stop them for long- don't bother spending your money on it! If you wrap the sore with tape or a sock, she will rip it off as soon as you are not around- and sometimes while you are looking right at her! Vets will give you an e-collar - these can work but the dog is restricted and, if you have an active dog it will be bumped, caught and eventually ripped. I purchased several oversized e-collars and my dog STILL found a way to press it back far enough on her neck to get to the sore on her paw. Eventually I went to a box muzzle, putting a heavy-duty duct tape over the bars that were under her jaw so she could not lick through. This allowed her to drink, but she could not eat without "parental supervision". Now, these products will keep the dog off the sore, but once off, they generally quickly find that the licking still feels good so - lick, lick, lick can happen quite quickly. Use of the StopLik here helps break the learned cycle of licking and keeps any other dogs in the household from assisting! Anti-obsessive drugs - these can help the dog calm down and assist in removing the need to lick. These take time to work and, once therapy is done, requires a withdrawal period. *NOTE- sometimes it takes higher does than normally prescribed to get the intended result. While the wound is still open, I used a good antibacterial pet shampoo from my vet and washed the area every day. You have to let the shampoo sit for 15 minutes and rinse well. You can get a good antibacterial rinse and a cortical/ antibacterial spray, too. So- OK- what exactly do you do - well what exactly worked for me? Get the dog on anti-obsessive drugs and steroids as prescribed by your vet. FYI- the generic prozac should be given at about 2X the dose for some dogs and sometimes higher doses, depending on the dog. Get her on the antibiotics 2X a day. Give your dog the vitamin E, C, & Omega blend - this should never stop. Use the daily antibacterial wash while the wound is open and let it dry. During this time I used the box muzzle because re-wrapping was time consuming and the StopLiks would be destroyed when I tried to re-position them. Exercise and break the routine! I found my dog needed to be indoors with more social contact and required more play time than I was giving her before. Once the area starts to have some new skin, use the StopLik strips as directed. I took them off about once a week to wash and dry the area and then put a new one on. I continued this for about 6 weeks - this is a process and timing can be different for each dog. I would watch her to see if she would attack the paw, but it seemed she eventually did not feel it was so important. One day, you will have to give it a real try - will she lick it like crazy when you are not home? With longer and longer tries, my girl did not and I could eliminate the restraints of the muzzle or the StopLik. I continued on the antibiotics until there was a real nice healing and hair grew back. I withdrew her from the anti-obsessive drugs very slowly, steroids as the vet stated and antibiotics continued until the area was totally healed. She continues on her vitamins every day. She now has a raised area that is rough but some hair has returned. Most important- it is healed with possibly a tiny lesion or two erupting once in awhile. NOTE- I have found that you need to continually monitor these animals. Although, not obsessive, she will lick on occasion and I remind her with re-application of a StopLik for a few days. She tends to get moist dermatitis between her toes and the occasion cut from brush. ANY skin irritation needs to be quickly tended to avoid starting another cycle. They just do it. It can be healed and it can be stopped, but you need to stay on top of things with them- it is worth it! They are happier, healthier animals and I believe they appreciate the efforts you put forth. 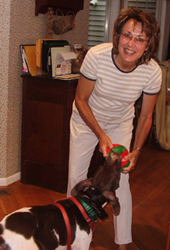 I have worked as a animal behaviorist and obedience instructor for several years, and I am very happy to recommend StopLik as a behavioral training aid. StopLik products first came to my attention while assisting Virginia German Shepherd Rescue with a petite female GSD being returned by the owner. The VGSR often requests my services in their efforts to rehabilitate dogs with behavioral problems that prevent them from being adopted. The dog in question, Vixen, had came back to the rescue with some minor aggression towards other dogs, and the a small wound on the inside of her right rear foot. The owner claimed that she had scratched it and wouldn't leave the area alone. Upon further inspection, I could see that there was a hard lump beneath raw area she was licking. She was treated for the "scrape" with antibiotic ointment and Vetwrap, and given Cephalexin for the infection. She left the bandage along initially, and we all gave ourselves a big pat on the back for a good day's work. After a week the lump was gone, but a small indent remained where she had literally licked down into the lower dermal layers. We continued the antibiotics and bandaging for two more weeks until the leg had healed, and new fur was just beginning to grow. The problem was that her wound was not initially recognized as a lick granuloma (early stages). The infection was burrowed deep in her leg, and was continuing to cause itching. Whereas we though the new hair growth marked the end of the healing process, her body was still fighting the bacteria off. Every time that we removed the bandages, she would go back to licking. At this point, it had become a psychological behavior as well as a physiological infection that was getting out of control. What started as a scrape the size of a fingernail had grown to a several inch strip of raw flesh on her leg. Eventually Vixen began to chew the bandages away and really began to do damage. No e-collar or bitter deterrent would stop her at night when we couldn't supervise her. Luckily, during my research on lick granulomas via internet, I stumbled upon the StopLik website. The product was innovative, and I contacted the company for more information. Curious of my opinion as a behaviorist of the product, the wonderful representative rushed me a sample kit to try on Vixen. By the way, I ALWAYS test products on myself before using them on my dogs. The product doesn't cause harm if accidentally brushed up against skin, but (I'll skip the humorous story of how I came to find this out) they do indeed work if a tongue or nose makes contact with the bandage. It sure stung, but it was momentary and didn't cause any prolonged discomfort (and this was the red bandage-used for determined lickers/chewers). It felt a bit like a static shock that you get after shuffling across carpet in socks. I only had to use the bandage for three weeks. It was amazing. The negative association with licking her leg was instantaneous and after two test licks, she ignored the wound completely. This association continued after the bandage was removed, and she made a full recovery. Because we caught the symptoms early enough, she doesn't even have a scar! 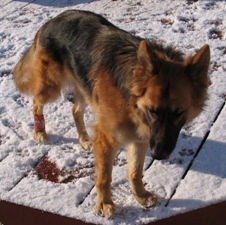 Traditional e-collars can cause depression and frustration through lack of movement. StopLik allows a dog to behave normally, therefore maximizing the chance of recovery. Paired with proper medication, exercise, and mental stimulation, I feel that it is a dog's best chance of rehabilitation from a lick granuloma and/or other surgical procedures. I have since found other surprising uses for the bandages, including: furniture chewing, counter surfing, inappropriate biting/nipping, overly aggressive play behavior (neck biting), and more. I seem to find unusual was to use it every day. This simple yet innovative product truly is revolutionary. P.S. Vixen's story has a happy ending. I fell in love with her so much that I couldn't bear to part. She now is a fully fledged member of my pack.